Vicki Noble rekindles the forgotten lineage of female-to-female transmission--the sacred flow of energy between women that has never been possessed by the patriarchy nor by any male. 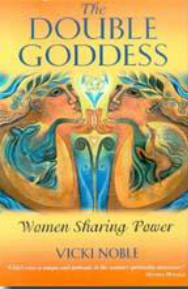 The first book to seriously study the double goddess that figures prominently in Neolithic and Bronze Age cultures offering an important symbol for modern women seeking to reconnect with their ancient, integral sense of self and wholeness. Presents an archetype for the sacred potential of female bonding. Illustrated with 149 examples of double goddess images.